Discover the best of Corolla with a stay in the aptly named Postcard Perfect – a charming 2 bedroom, 2 bathroom vacation rental that has a stellar locale in the heart of the Currituck Club Resort , a Reese Jones Championship Golf Course. With fabulous club amenities that include a trolley to the beach and a valet to carry your beach chairs to the sand, every visitor can enjoy an ample taste of luxury while being just a shell’s throw from some of Corolla’s top shops, attractions and amenities. Golfers will be lured by the adjacent acclaimed course, while outdoor lovers of all tastes can be fully entertained via the Currituck Club’s 7 tennis courts, 2 community pools, playground, and other resort-quality amenities. Stroll along the lighted walkways and bike paths to explore the safe and inviting neighborhood, or enjoy an easy trolley ride to the oceanfront for long days at the nearby undeveloped beach - there’s enough entertainment surrounding Postcard Perfect to fill two vacations. Step inside after a full day of adventures, and you’ll be utterly charmed by the smart décor and furnishings of Postcard Perfect. Bright pops of blue perfectly complement pastel touches of peach in the sunny living area, dining area, and kitchen, creating a bright and airy space that’s perfect for family get-togethers. Step outside for a breath of fresh air and a lingering cup of coffee on the shaded deck, or retreat to one of two bedrooms, which feature beautiful beachy touches and plenty of natural light. From the sunny interior to the abundance of entertainment waiting just a shell’s throw away, Postcard Perfect offers guests a truly memorable vacation with every stay. 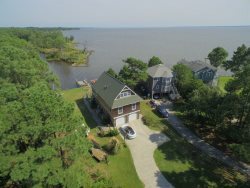 Located in one of Corolla’s favorite and most engaging communities, this pristine vacation rental will entice guests to return to the scenic northern Outer Banks again and again. Property Layout - One King Master bedroom and 1 bedrooms with 2 twin beds.